So, for two days I worked on a blog post relating to a rewatch of Gilmore Girls that I'm in the middle of. And then I realized I kind of hated it. So instead, I'm going to post a little snippet of a potential romance that I wrote when I needed a break from the novel I'm perpetually working on. It should be noted that this is a rough first draft so...it's not perfect, by any means. Enjoy! Liam O’Donnell lay in his bed across town, doing his own avoidance routine. He listened to the sounds of his roommate Trevyn getting ready for work, and wondered what the odds were that Trevyn would say anything about last night if Liam were to emerge from his hole. Last night. It seemed like a good idea at the time. A text blast: hey, Beta Radio’s playing downtown tonight, who’s in? It was a week night, but only a few bowed out due to early morning work commitments. Liam had gotten to the bar early, grabbed a drink and sat in the back with his laptop, finishing up some freelance work that was due in a couple of days. A couple of hours later, he glanced up from the screen as he saved his progress and saw Holly walk in the door. Her long, burnished gold hair hung loose around her shoulders. Liam thought she must have come straight from work, since she was wearing a soft orange sweater, tailored gray skirt, and heels, rather than her usual jeans and flip flops. Of course, she looked amazing, whatever she was wearing. He watched as she stood in the back for a moment, glancing around the bar. A column and the back of the booth blocked Liam from her view, and he debated standing up and waving to her. Things between them since the breakup were usually fine, but definitely more fine in a group of people. Plus, if she couldn’t see him, he could watch her unguarded. A big table close to the stage opened up, and Holly made her way there to snag it. Just as she was draping her jacket over the back of a chair, the bar door opened again and Trevyn and Elaine walked in, laughing loudly. They waved at Holly and made their way to her, Trevyn gesturing grandly, Elaine still giggling. Trevyn did tell the best stories. Liam stayed put, watching as a few more friends arrived. He watched Holly laughing and hugging everyone, watched as they all ordered drinks and a few ordered food, most having come from work since the show was pretty early. He saw Holly continually glancing around, and Liam told himself that maybe she was looking for him. But he knew, as her gaze occasionally paused on a good looking guy here and there, that she was looking for someone new. Fresh. Different. Holly was a dater – she liked having fun, and she liked to do it with new people. She went on a lot of first dates. Liam and Holly had dated for two months, and it was the longest she’d ever been with the same person. Eventually, Liam packed away his laptop, slung his bag across his chest, and walked toward his friends. He was greeted with the usual hellos and hugs and backslaps. “I’ll survive,” Liam said drily. Trevyn was a bit of a health nut. He played basketball in a weekly game with work buddies, and was in a flag football league. Six-pack abs, rock hard arms…the works. He had a kind of young Idris Elba thing going on, and he joked that he had to eat healthy to keep up appearances. But he had a weakness for nachos. Well, nachos and Britt’s donuts, but at least you could only get those nine months out of the year. Liam hung his bag over the back of his chair and asked the waitress who’d just arrived for another pint. He leaned back in his chair and looked around the round six-top, at which eight of his friends were crowded around. Trevyn, Elaine, and Mike sat closest to the table, Trevyn and Mike polishing off their nachos while Elaine ate a burger and fries. Then there was Chris, Trina, Hannah, Hannah’s friend Brent, and of course Holly. All of them except Brent had been friends since their freshman year at UNCW. All Yankees lured South by the promise of beautiful beaches and warm weather. Trevyn and Liam had been friends since junior high, and neighbors in a small town in Wisconsin. They'd met Mike and Chris on move-in day. Mike came from Indiana, and Chris from Ohio. They’d all bonded over a love of Mountain Dew and Pepsi (an enigma in North Carolina’s Coke and Sun Drop crowd), and braved the freshman waters together. Trevyn met Elaine and Hannah in his biology class their first semester, and when the six of them started hanging out, they’d brought along Trina and Holly, fellow Midwestern buddies from their orientation group. After the initial – it’s so nice to have met people with the same taste in music/movies/books/food – there was a brief period of awkwardness where nearly everyone fumbled through some almost hookups, before deciding that they were all better off as a group of friends. Of course, Holly and Liam broke that unspoken code, but that was many years later so the breakup didn’t have quite the same effect it could have in college. And then they’d all stayed, gotten jobs, moved in. The beach town had delivered on its promises, and no one had wanted to shovel feet of snow every winter or give up year-round access to the beach. It was a pretty common occurrence in Wilmington – come for a degree, stay forever. Bugged the locals, but it helped keep the economy going. “Hey, gorgeous.” Liam caught a whiff of gardenia perfume as Holly slid into the chair next to me and gave me a hug. Holly had an art history fellowship through UNC Chapel Hill that allowed her to work at UNCW as a adjunct while doing research on her dissertation. She’d been afraid that she’d have to move after she’d been accepted, but the committee had agreed to let her work under one of the professors in Wilmington and just drive to Chapel Hill once a week for meetings and lectures. Liam told her about his projects, noticing as he did that while Holly was certainly listening – commenting and asking questions – her eyes kept up their constant scan of the bar. It was the first thing that started coming between them when they were dating: Liam getting hurt at her seeming innatention. He remembered several fights during evenings out. It still bugged him a little, but he knew he had no right to ask her to stop. Instead, he just cut his work commentary short. Before too long, everyone was talking with everyone else, but Liam felt like he could only half concentrate on the conversation because the other half of him was acutely aware that Holly’s chair had migrated closer and closer to his. That her left side was pressed against his right side as she leaned into the group’s conversation, gesturing to make a point. She laughed at something Brent said – Liam hadn’t heard the joke – leaning even more into Liam, her left arm now resting across his back. He wondered if he could shrug her off without making a scene, maybe get up and go to the bathroom. But as he was wondering this, the band took the stage, and the low bar lights got a bit lower. Liam felt stuck. He didn’t want to get up now, he didn’t want to make a scene – and extracting himself from Holly would do that, he knew from experience – but his nerve endings were lit up, and he wasn’t allowed to feel that way anymore. The band was fantastic, as usual, and Liam tried to concentrate on the music. Not on the smell of gardenias, or the silk of Holly’s hair against his jaw as she rested her head on his shoulder. Not on the feel of her skin as she wrapped her arm around his. He caught a few of his friends eyeing him, Trevyn giving him a pointed look that said buddy, just pull out, you’re embarrassing yourself. As if it was that easy. It should have been that easy. And no, when the music was over and everyone stood up to head home – work night after all – he should have followed Trevyn out the door. Not said “Okay” when Holly said “I’m wired! Let’s go walk along the water.” Not let her wrap her arm around his waist as they walked out the door and along the boardwalk. It’s not that he didn’t enjoy her company as they walked mostly silent along the moonlit river. It’s that he enjoyed it too much. That when he walked her to her car and said goodnight, all he wanted to do was wrap her in his arms and kiss her senseless. And that wasn’t allowed anymore. Why hello there, internet. Long time no see. Apologies for my absence....I was busy being sick...and then getting ready for camp. And probably just kind of being lazy a few days in there too. It's hard to get back in the groove when you've gotten out of it. Anyway...while camping in the sweltering heat with a bunch of teenagers for a week may not sound like everyone's idea of a vacation (it was awesome, by the way! ), I did do one traditionally vacation-y thing last week: I read a book! A whole book, start to finish. You may remember how much I loved Me Before You. After I finished it, I just wanted more Jojo Moyes, so I immediately placed One Plus One on hold at the library, and it conveniently became available just before camp. I'd say it's not as technically well-written as Me Before You, but it's every bit as enjoyable. Jess is a single mom struggling to make ends meet and care for her doesn't-fit-into-this-small-town-slightly-goth-but-very-sweet stepson and her quirky and maths-crazy daughter (who perhaps has a touch of Asperger's? It's never really gone into in the book, but could be a possibility). Ed is a wealthy programmer and tech geek who is getting ready to go to trial for insider trading. He's laying low per lawyer's instructions and Jess is trying to get her daughter to a Maths Olympiad in Scotland. Jess and her friend -- who work as house cleaners -- have been cleaning Ed's coastal house for quite a while, but their first in-person encounter doesn't leave much of a favorable impression. When Ed happens to come along when Jess's plans get derailed, he offers to give her, the kids, and their huge dog Norman a ride to Scotland. 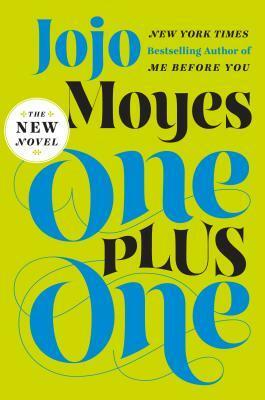 One Plus One is a love story, a family story, a story about finding your tribe, about optimism and disappointment.